Data in a GIS can be represented as a thematic map. A thematic map depicts a specific subject and typically emphasizes the spatial distributions of a theme, or subject. A typical thematic map is made up of several base themes such as roadways, water bodies, property boundaries, etc. 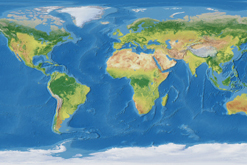 The GIS converts the thematic map’s spatial data into the same coordinate system which allows themes to be combined and symbolized individually. Hot spot maps depict clustering in a spatial distribution. Simply put, a hot spot map depicts the areas of your theme where something just seems out of the ordinary. However, since the map is depicting data from the past, what was out of the ordinary at the time may be normal now.